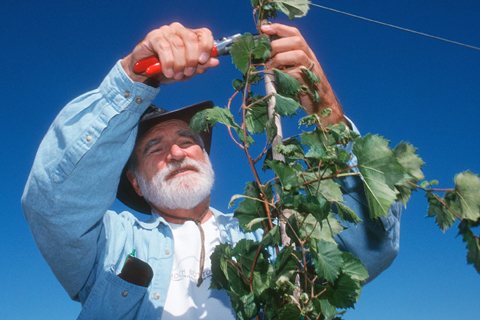 Paul Read, director of the University of Nebraska's viticulture program, prunes grapevines at a research site in Nemaha County in this 2000 file photo. Read's work at the university since his arrival in 1987 has helped the state's wine-making industry grow from nearly nonexistent to more than a dozen wineries and more than 100 vineyards expected within the next year. IANR Photo by Brett Hampton. Just over 10 years ago, Nebraska wine-making was nonexistent. Findings of two research projects involving UNL scientists were named among the 100 most important discoveries and developments in science in 2004 by Discover magazine. Ted Kooser, poet laureate of the United States and professor of English at UNL, will give the address and receive an honorary doctor of letters degree at UNL commencement exercises Dec. 18 at the Bob Devaney Sports Center. If a journey of thousand miles begins with a single step, a journey to a bachelor's degree could be said to begin with a single class. Starting college can be a challenge for any student, but it can be more challenging for students of color at a predominantly white university. At UNL, the Office of Academic Support and Intercultural Services is here to help. Techniques devised by UNL chemist David Hage will give pharmaceutical companies a powerful new tool for developing, testing and targeting dosages for drugs. If this image won't get you in the mood for winter weather - and the holiday shutdown - then perhaps nothing will. This undated picture shows the south facade of the old Administration Building from R Street. This building is now the north part of Canfield Administration Building, but this wintry picture, taken facing east, was shot before the south wing was added.